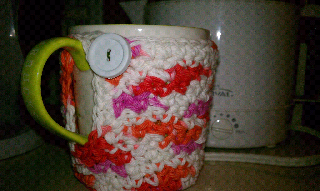 I've been wanting to make a mug cozy for some time note. Honestly, I don't know what's been holding me back. Yesterday, on Tangled Happy, Sarah shared a link to a pattern for the Mug Coaster Cozy. I fell in love with it. I've nicknamed it the Mug Hug.